Dowel screws are designed to fix two pieces of woodwork to each other. All handrail fittings and ramps are joined to handrails, and each other, using a dowel screw set, which comprises of a dowel screw, locking nut and washer are dispatched together. Dowel screws are double ended screws. The centre of the dowel screw found in these sets has a hexagonal flat face allowing mole grips to twist the screw in. To fit parts together, screw the wood threaded part of the dowel screw into a hole in one part to the full extent of the thread. Then you can fit together the two component faces and apply glue to each face to fix them. 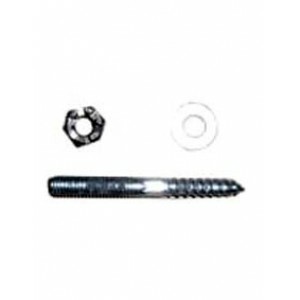 Secure the nut and washer to the bolt thread on the other end of the screw from an access hole.